The students, staff and the community have discovered transparency has a civilizing effect. Classrooms are on the second level. The inside is suffused with light, and a slight overhang creates a sheltered plaza area. 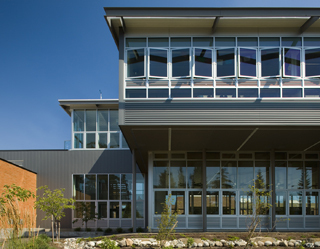 The Commons is in demand as a performance venue for all of Bainbridge Island. It’s a kind of indoor amphitheater, with wide concrete steps that follow the slope of a hill. 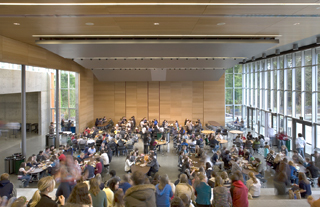 Most of the time it serves as an eating and meeting area for students.